In the past few years, I have sadly witnessed a growing number of personal attacks impugning the integrity, character and credentials of the late Raymond N. Rogers, STURP chemist from Los Alamos National Laboratory. Although his research on the Shroud is empirically honest, is published in highly regarded peer-reviewed journals and speaks for itself, I believe it is time that the public get some background about the “other” Ray Rogers that he never revealed to the “Shroud crowd” himself. That is the primary purpose of this short presentation. 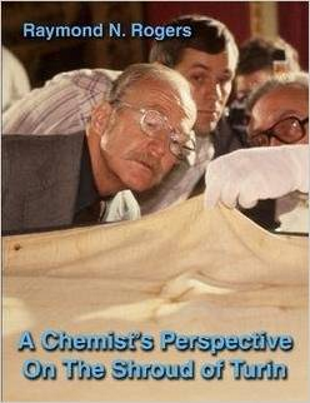 Pictured: The cover of the book, A Chemist’s Perspective On The Shroud of Turin by Raymond N. Rogers. Amazon is redirecting prospective buyers to office_bookshelf who is selling new copies for $97.00. However, according to Lulu the book is available directly from them for $58.95 (see A Chemist’s Perspective on the Shroud of Turin). A Chemist’s Perspective on the Shroud of Turin where you can view a preview or download the book directly from iTunes’ iBookstore for iPad and iPhone. You can get the whole thing as an e-book quite cheaply. What is striking when you read Rogers book, is whereas people may think there is a shadow scientific committee thinking of the shroud’s conservation, 2002 restoration proved there was simply no pilot in the plane. Rogers has left shroud science orphan.